ALFRED'S OCEAN PALACE is a family owned & operated seaside restaurant & bar/beachfront guest house. Located on Jamaica's most western point, in the heart of Negril's famous seven mile white sand beach. Offering CLEAN, COMFORTABLE ROOMS in a casual atmosphere at reasonable rates! Alfred's is one of Negril's first & original establishments for tourists. Jamaicans & people from all countries congregrate, mingle & socialize here. 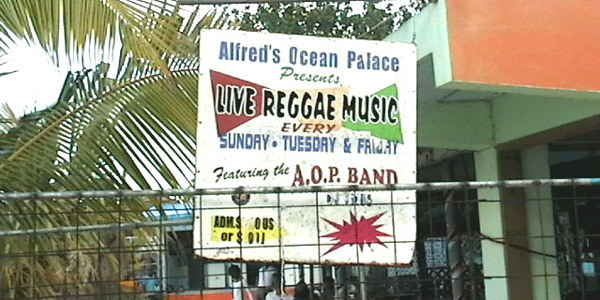 Now more than 20 years old, Alfred's has become a Negril beach tradition & is the premiere entertainment spot in western Jamaica.Striving to provide the customer with the most entertaining REGGAE SHOWS & a truly cultural atmosphere & experience. Showcasing some of Jamaica's hottest high energy, roots rock & reggae performers. Not a chain restaurant or an imported fake. ALFRED'S RESTAURANT is known for service quality and local /international country style cooking. Specializing in locally caught seafood such as: lobster, conch, mahi mahi, blue marlin, tuna, kingfish and calamari. Dine in the dining room or at a candle lit table under the stars. THE MENU changes with the seasons & the sea. The fish & chips at lunch is a favorite among the locals and internationals alike! Negril P.O. Box 3081, Jamaica W.I.